The Dark Energy Survey, which studies the accelerating expansion of our universe, uses one of the most sensitive observing tools that astronomers have: the Dark Energy Camera. Built at Fermi National Accelerator Laboratory and situated on the Victor Blanco 4-meter telescope in Chile, the camera spends 30 percent of each year collecting light from clusters of galaxies for DES. Another chunk of time goes to engineering and upgrades. The remaining one-third is split up among dozens of other observing projects. A recent symmetry article looked at some of those projects—the ones that are studying objects within our solar system. In this follow-up, we give a sampling of how DECam has been used to reach even farther into the universe. The sun is a “normal” star, humming along, fusing hydrogen to helium in its core. Most of the stars in the universe produce energy this way. But the cosmos contains a whole collection of stranger stellar objects, such as white dwarfs, brown dwarfs and neutron stars. They also include exploding stars called supernovae. Ten projects use the DECam to study these stellar varieties. Armin Rest, an astronomer at the Space Telescope Science Institute in Baltimore, Maryland, leads two of those projects. In the past two years, he has spent 28 nights at the Blanco Telescope looking for supernovae. In both projects, Rest looks for light released during stellar explosions that has bounced off dust clouds on its way to our night sky. These “light echoes” preserve information about the blasts that caused them—for example, what type of star exploded and how it exploded. “It is as if we have a time machine with which we can travel back in time and take a spectrum with modern instrumentation of an event that was seen on Earth hundreds of years ago,” Rest says. DECam’s expertise in taking fast pictures of big areas makes this search much more efficient than it would be with other instruments, Rest says. Astronomers have found many streams of stars winding tens of degrees across our sky. These streams are the telltale signs of galaxies interacting with one another. The gravity of one galaxy can rip the stars out of another. Yale University’s Ana Bonaca is working on a project that uses DECam to map the stars in one such stream. It extends from Palomar 5, a conglomeration of thousands of stars at the outskirts of our galaxy. 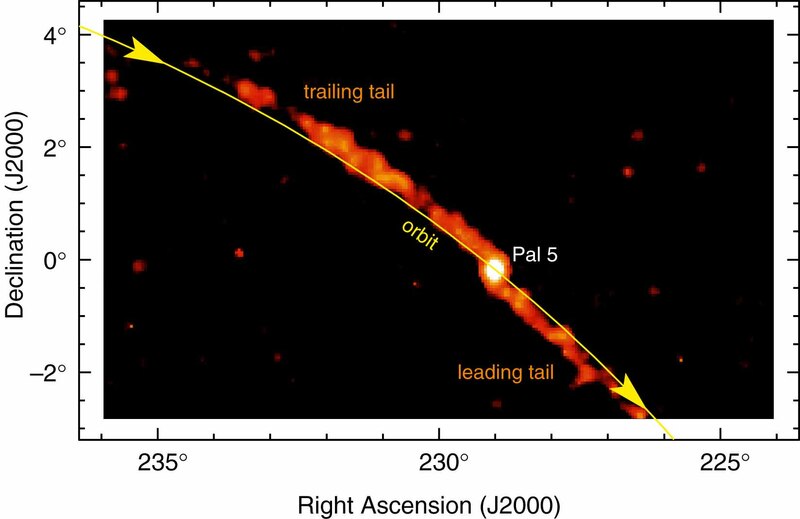 Palomar 5 is one of the lowest-mass objects being torn apart by the Milky Way, “which means that its streams are very narrow and preserve a better record of past interactions,” Bonaca says. Scientists are hoping to tease out of these observations information about dark matter, which accounts for some 80 to 90 percent of our galaxy’s mass. Scientists expect that in a narrow stellar stream, clumps of dark matter will create density variations. If you can map the density variations in such a stream, you can learn how the dark matter is distributed. This is where DECam’s strength comes in: The sensitive instrument collects light from deep imaging across large fields speckled with long, narrow stellar streams. Ten other projects are using the instrument for similar research. Bonaca and colleagues expect to publish their findings later this year. “Our preliminary maps of the Palomar 5 stream show tantalizing evidence for density variations along the stream,” she says. Our galaxy is just one of at least 100 billion galaxies in the universe. Those other galaxies are the focus of eight projects using the Dark Energy Camera. The DECam Legacy Survey, for one, is currently imaging all of the galaxies in 6700 square degrees of sky. 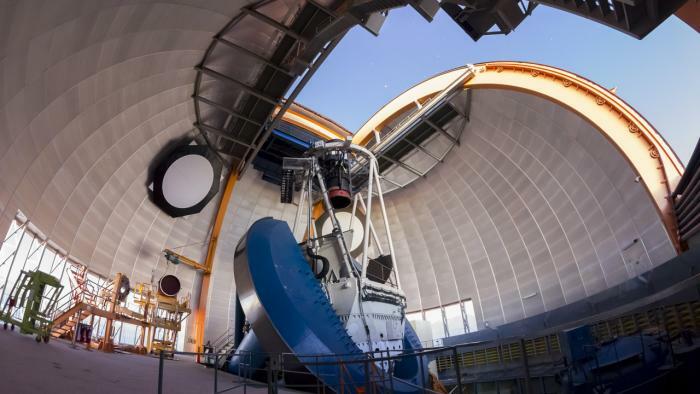 The plan, says David Schlegel of the Lawrence Berkeley National Laboratory, is to combine the information gathered from DECam and two telescopes located at Arizona’s Kitt Peak National Observatory with the images, spectral data and distance measurements collected via the long-running Sloan Digital Sky Survey. “The combination of the Legacy Survey imaging plus SDSS spectroscopy will be used for studying the evolution of galaxies, the halo of our Milky Way and other things we’ve likely not thought of yet,” Schlegel says. The other goal of the survey is to identify some 30 million targets to study with the Dark Energy Spectroscopic Instrument [DESI}, a recently approved instrument that will be installed on the Mayall 4-meter telescope at Kitt Peak. Members of the Legacy Survey team have been releasing their observations nearly immediately to other researchers and the public. They have much more observing time ahead of them: In total, the project was awarded 65 nights on the Blanco telescope and DECam. So far they’ve used only 22. Most of the galaxies in our universe are gathered in groups and clusters, drawn together by the gravity of the clumps of dark matter in which they formed. Scientists are using DECam to study how matter (including dark matter) is distributed within clusters holding hundreds to thousands of galaxies. When you observe a galaxy cluster, you also collect light from objects that lie behind that cluster. In the same way an old, imperfect window warps the light from a streetlamp, a cluster’s galaxies, gas, and dark matter shear and stretch any background light that passes through. Astronomers analyze this bending of light from background galaxies, an effect called “gravitational lensing,” to map the mass distribution of a galaxy cluster and even measure its total mass. Seven projects use the DECam for such studies. Ian Dell’Antonio of Brown University leads one of them. He and colleagues study the 10 largest galaxy clusters that fit within the DECam field of view; all of them are between about 500 million and 1.4 billion light-years from Earth. The researchers are about halfway through their dozen observing nights. They have so far differentiated between gravitational lensing by galaxy cluster Abell 3128 and gravitational lensing by another background cluster. They estimate the mass of Abell 3128 is about 1000 trillion times the mass of our sun, and they have identified several clumps of dark matter, Dell’Antonio says. And, it seems, for just about any other type of astronomical imaging scientists can think of. 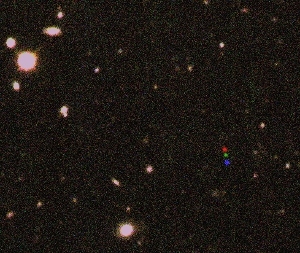 The discovery images of 2012 VP113, as made by the Cerro Tololo Inter-American Observatory [read DECam at Blanco]. The image is a merger of three images with three colored dots pinpointing the image of 2012 VP113. The three images were taken 2 hours apart each. The red dot represents 2012 VP113’s location on the first image, the second represents its location on the second image, and the blue dot representing its location on the third. Craig Hogan, head of the Center for Particle Astrophysics, wrote this column. To create small things you need particles with lots of energy, and to learn about them you need to capture and study lots of particles. So it is not surprising that the worldwide physics community is in the business of building giant accelerators and detectors..
We also find out about new physics without using accelerators by studying the biggest system of all — the cosmos. Such experiments also need big detectors, in particular, giant cameras to make deep, wide-field maps of cosmic structure. For example, Fermilab’s Dark Energy Camera (DECam) is now collecting data for the Dark Energy Survey, using light from distant galaxies gathered by the 4-meter Blanco telescope on Cerro Tololo in Chile. Designed for depth, speed, sensitivity and scientific precision, it’s a behemoth compared to the camera in your phone. By the time you add up all the parts — the detectors, the lenses, the cooling systems, the electronics and the structure to hold them precisely in place 50 feet up in the telescope beam — you have a machine that weighs about 10 tons. That may not seem very big compared to the Tevatron or the thousand-ton telescope the camera is mounted on, but it’s a lot for a digital camera — the biggest ever built. The giant telescope simulator used to test DECam has recently been removed from the Fermilab building where the camera was put together. In the same space, another giant camera will soon start to take shape. This one will study the cosmic microwave background — the primordial light from the big bang. That light has been cooled by the cosmic expansion to microwave wavelengths, so the camera detectors and even its lenses must be cold to match. About 15,000 advanced superconducting detectors from Argonne National Laboratory will be integrated into a camera system about as big as DECam and then shipped for an experiment to take place under the thin, cold, crystalline skies at the South Pole. This machine — the SPT-3G camera — will also be the largest of its kind ever built. When it is finished, it will be installed on the South Pole Telescope, where it will map the faint ripples of polarization imprinted on the light since it was created almost 14 billion years ago. The SPT-3G experiment will advance cosmic mapping by an order of magnitude, but it is also a stepping stone along a path to an even larger Stage 4 CMB project in the following decade. That project, endorsed by the P5 report and supported by a nationwide collaboration of labs and university groups now forming, will carry out a comprehensive survey of the primordial radiation over much of the sky and teach us about new physics ranging from neutrino masses to dark energy. In an ambitious five-year mission, the Dark Energy Survey team has devoted itself to mapping the southern sky in unprecedented detail, ultimately hoping to decipher what may stand as the most bewildering phenomenon of our expanding universe. In March, DES applied to the Large and Long Program at the Gemini Observatory, a program meant to foster scientific exploration through global collaboration. Although the Gemini Observatory has existed since 2000, the Large and Long Program launched just last year as another means to probe the shrapnel of the big bang. It offers time on two of the world’s finest telescopes, one located atop an 8,900-foot mountain in the Chilean Andes (Gemini South) and the other on Mauna Kea, Hawaii (Gemini North). Just last month, co-leader of the Strong Lensing Science Working Group at DES, Liz Buckley-Geer, received the email she’d been waiting for: Spread over the next three years, DES had been awarded a lofty total of 276 hours on Gemini South. 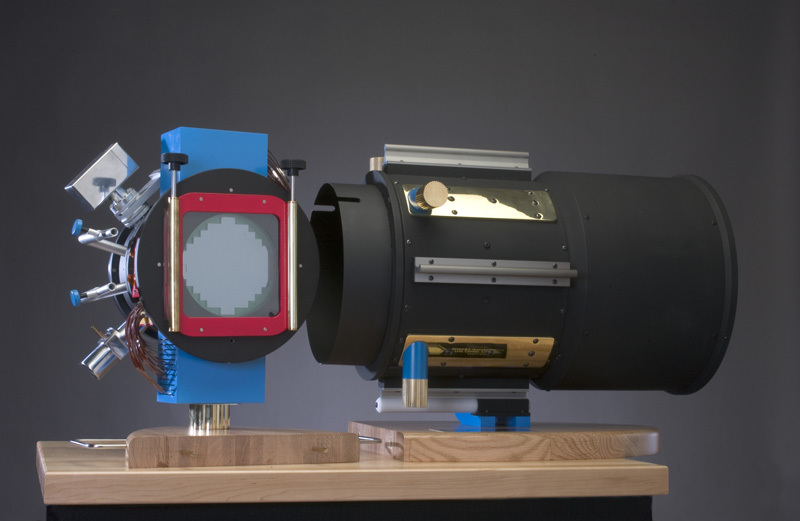 With a hefty 8.1-meter mirror, the Gemini telescope is twice as large as the telescope on which DECam is currently mounted. But DES scientists don’t plan to take new images with Gemini South. DECam images are plenty clear and show high-quality snapshots of galaxies and galaxy clusters. Instead of imaging, DES scientists will use an instrument called a spectrograph to further inspect the images and, in some cases, confirm a rare phenomenon called strong lensing. One of five methods DES uses to explore dark energy, strong lensing is the bending of light from a distant galaxy, or source, due to the gravitational influence of a massive foreground object, or lens. Lensing changes the observed shape of the distant galaxy and intensifies brightness. To find these strong lensing systems in the DECam images, DES scientists look for objects that look distorted, often appearing as long bright arcs, multiple blue knots or, in the rarest cases, an Einstein ring. 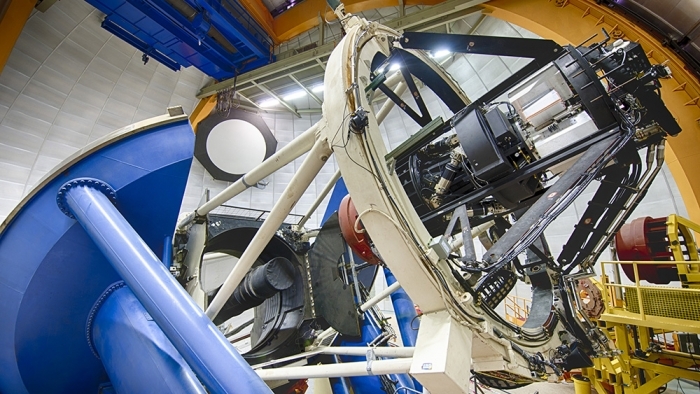 DES will focus on certain classes of strong lenses that can be used to study dark energy. “The strong lenses provide a kind of peephole to the more distant, fainter universe that wouldn’t be available if the lenses weren’t there,” said DES Operations Scientist Tom Diehl. But what appear to be strong lenses are not always so. To separate the lenses from the impostors, scientists measure the redshifts of both the lens and the source. A true strong lens is one in which the source redshift is larger than the lens redshift. A redshift occurs when light wavelengths increase, or shift toward the red side of the electromagnetic spectrum. The measured redshift of a galaxy is related to the expansion of the universe as a function of time, and it allows DES scientists to calculate the distance to the object. To determine the redshift of a galaxy, the scientists will compare the spectrum of the obtained light with known features in the spectrum of various chemical compounds found on Earth. If the same features are seen in an observed spectrum from a distant source but occur at shifted wavelengths, then the redshift can be calculated. Galaxy clusters — accumulations of hundreds of galaxies — are said to be the largest gravitationally bound structures in the universe. While this statement is correct as such, it easily conveys an incorrect picture: that of clusters as static, isolated spheres that have swallowed every galaxy within reach at some time in the cosmic past. Nothing could be further from reality. Galaxy clusters are not isolated but dynamic environments that actively accrete material from their surroundings. The preferred mode of accretion proceeds along so-called filaments, the connecting links between the central hubs of the cosmic web. The existence of filaments is a prediction of the cold dark matter model we use to describe the formation of structures in the universe, revealed in large cosmological simulations and spectroscopic surveys. The new Dark Energy Camera was built by the 300-member Dark Energy Survey (DES) collaboration to carry out a five-year survey to probe the origin of cosmic acceleration. The camera is mounted on the Blanco 4-meter telescope at the Cerro Tololo Inter-American Observatory in Chile and saw first light in September 2012. Shortly after the camera was commissioned, we proposed a program to target several massive galaxy clusters as part of a process called science verification, a rigorous test of the new instrument. The prospects for this project were mixed. After the overhaul of the telescope control system and with the new camera, nobody could guarantee that the images we were going to obtain would have the necessary quality for accurate studies of these clusters. But if it worked, we could exploit DECam’s massive field of view of more than 3 square degrees (roughly 15 times the area of the full moon) to study not only the clusters themselves, but also the environments from which they accrete. It worked. Over the course of 18 months, I led a team that ultimately involved more than 90 DES scientists from 37 institutions worldwide. In our recently submitted paper, the first based upon DES data, we demonstrated that the new camera and revamped telescope worked together as expected. This data and our careful analysis allowed us to determine the distributions of so-called red-sequence galaxies, whose red color is a reliable tracer of the dynamical processes in clusters. Furthermore, we exploited an effect called gravitational lensing to infer the mass distributions of these clusters, an analysis with exceptionally stringent requirements on image quality. Everything lines up. The visible orientation of the brightest cluster galaxies sitting at the cluster centers; the mass distribution tracing hundreds of cluster galaxies (shown in the image below); the large-scale distribution of red-sequence galaxies far beyond the gravitational reach of the actual clusters: All these probes show that clusters are indeed interwoven with the cosmic web, the structure of which DES will reveal in unprecedented detail. The Dark Energy Spectroscopic Instrument will create the clearest three-dimensional map yet of one-third of the sky. Maps do more than tell us where we are. Rich with information elegantly arranged, they give us a way to assimilate our vast world. The clearer the map, the more confidently we set out to explore, looking for something it doesn’t show. In a few years, scientists will come out with a new map of a third of the sky, one that will go deeper and bring that depth into sharper focus than any survey has yet achieved. It will pinpoint in three dimensions the locations of 25 million galaxies and quasars, pulling back the curtains on the history of the universe’s expansion over more than half of the age of the universe. Armed with this detailed picture, scientists will be better equipped to search for something the map can’t show but whose effects will likely be all over it—dark energy. The researchers’ cartographic tool will be the Dark Energy Spectroscopic Instrument, or DESI. The DESI project, managed at Lawrence Berkeley National Laboratory, is one of a number of surveys looking to get a handle on how dark energy operates. Whatever it is, it leaves its trace in the growth and structure of the universe. DESI will model the universe’s expansion using two approaches. One is to precisely measure the spectra of the light coming from galaxies to determine their distance from us. The redder the light is, the farther away the galaxy. The other approach is to measure the distances between galaxies. Galaxies arose from areas left dense with matter when the universe cooled down from the rapid expansion of the Big Bang. These peaks in density are known as baryon acoustic oscillations. Back when the peaks formed, they corresponded to a separation of about 490 million light-years. Since then the expansion of the universe has stretched them apart. Comparing the standard ruler against the distances between galaxies as the universe developed to its current state, scientists will be able to measure how space has stretched since the early times. Together, the measurements will tell scientists how and how fast the universe is growing. “Being able to make those two measurements at the same time—one about the expansion rate of the universe and the other about how structure is growing—allows you to test the theory of general relativity on this huge length and time scale,” says SLAC National Accelerator Laboratory’s Risa Wechsler, DESI co-spokesperson. DESI will be the first survey to make measurements accurate to less than 1 percent of the expansion rate of the universe over the last 11 billion years. 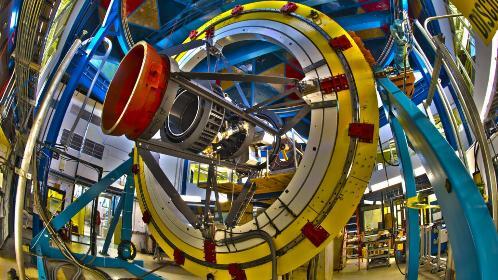 The Dark Energy Spectrographic Instrument is designed to attach to the Mayall 4-Meter Telescope (2 pictures below) in Arizona. Once construction is completed, it will have 5000 fibers for collecting the spectra of galaxy light. Using data from the Dark Energy Camera in Chile, which is currently focused on taking imaging data for the Dark Energy Survey, DESI will point each of those 5000 fibers at a galaxy. Once the fibers get what they need, they will move on to the next set of 5000 celestial objects. “It’s like a big pincushion that wiggles at every image,” Flaugher says. “Every 20 minutes you take an image, and then you reposition each of these little fibers onto new targets.” It will keep doing that until it hits 25 million galaxies. DESI grew out of two separate proposals to develop a spectroscopic instrument to explore dark energy. The DESI collaboration is made of 180 scientists from 45 institutions around the world, including five DOE laboratories. Scientists expect to finish DESI’s construction in 2018. The experiment will then run for five years. “The other cosmic surveys that are going on now and over the next 10 years—the Dark Energy Survey, LSST—are spectacular, and they’ll take images of a lot more galaxies than DESI will measure, but they’re making a 2- or 2.5-dimensional measurement of the universe.” Wechsler says. Reblogged this on The Nomadic Cosmologist. For seven minutes earlier this month, two Fermilab physicists moonlighted as astronomers who, like the Men in Black, were positioned to protect the Earth from the scum of the universe. On Feb. 3, Alex Drlica-Wagner and Steve Kent were in Chile taking data for the Dark Energy Survey when they received an email stating that a satellite telescope had picked up signs of a potentially hazardous asteroid, one whose orbit might soon meet with Earth’s. The message had come from a scientist at the Jet Propulsion Laboratory. Bad weather in the northern hemisphere had foiled attempts by JPL’s two go-to cameras to photograph the asteroid, hindering the lab’s ability to predict its orbit. Could the Dark Energy Camera take a bit of time off from its usual task of imaging distant galaxies to take pictures of this near-Earth object? Since the asteroid was new on the orbital block, astronomers had only a rough idea of where it was headed. They did know it would soon pass in line with the sun and thus be difficult to spot in photographs. Given Chile’s clear skies and DECam’s large field of view, Drlica-Wagner and Kent were fairly confident they could catch the asteroid on camera in five takes, even if its predicted location was only an estimate. They punched in the coordinates JPL gave them and took their shots. Seven minutes later, they had photos. The asteroid turned up in all five, though it wasn’t immediately apparent. The images had to be processed by the National Optical Astronomy Observatory in Tucson, Ariz., and coordinates submitted to the Minor Planet Center in Cambridge, Mass., to figure out the orbit. The results were then sent to JPL. The asteroid looked just like the faint stars that it shared the photos with, except for one characteristic — it appeared in different positions in the five images, just the way a cartoon dot would move in a flipbook. After combining the pictures with the satellite data, the asteroid-tracking crew brought good news. “People shouldn’t be particularly worried,” Drlica-Wagner said. At its closest approach to Earth on March 1, newly discovered Apollo-class asteroid 2014 BE63 will be 18 million miles away. 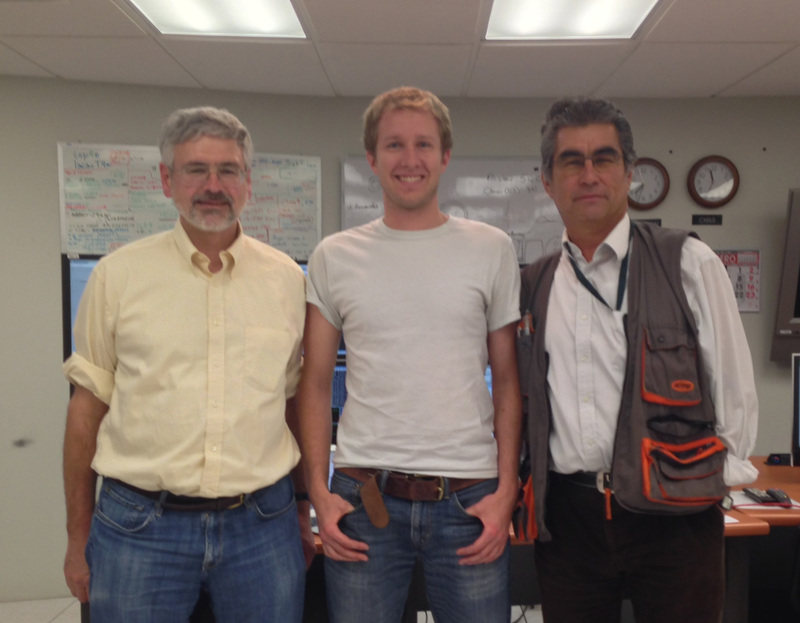 The Dark Energy Camera scientists were glad to come to the aid of fellow astronomers. The power of the 570-megapixel Dark Energy Camera lies in its ability to capture celestial objects millions of light-years away. Scientists are now working toward developing an instrument for characterizing these stars and galaxies in greater detail. Scientist Juan Estrada, PPD, is currently leading a Fermilab team to develop a large instrument using detectors called MKIDs, short for microwave kinetic inductance detectors. In the coming years, they’ll use it to obtain more information about the astronomical objects already detected by the Dark Energy Camera, pointing it into the night sky to capture more information about those objects’ light. The team builds on the work of a University of California, Santa Barbara group, led by Ben Mazin, which developed MKIDs for the visible and infrared spectrum. The Dark Energy Camera is outfitted with 74 charge-coupled devices, better known as CCDs, and its optical filters divide the light from far-off galaxies or stars into one of five spectral ranges. When a CCD gets a hit from one of the photons from the split-off light, it sends a small signal saying that the light in that filter’s range of wavelengths has come through. The data from the five filters are then reassembled into a color picture of the galaxy or star, much the way your computer monitor layers red, green and blue pixels to generate full-color images. Thus DECam’s filter-and-CCD system gives scientists the rough spectral make-up of an astronomical object. An MKID, however, would enhance that five-color rendering many times over. When struck by a visible photon, it produces a flood of so-called quasiparticles, allowing the wavelength for every single photon hitting the MKID to be precisely measured. That, in turn, leads to color images of astronomical objects without the use of optical filters. The higher the photon’s energy — or the more towards the violet end of the spectrum it is — the more particles it produces. MKIDs, which use superconducting material, must be very cold to be able to detect photons. In testing the current MKID-based prototype instrument, Estrada’s team recently brought it to a temperature of 33 millikelvin — the lowest temperature ever achieved on site at Fermilab. Over the next several years, the team hopes to create an MKID prototype instrument that can be installed in a telescope on a mountaintop next to DECam for testing. This means assembling it with a compatible mechanical design and high-bandwidth digital processing system. If all goes well, they can look realistically to constructing instruments installed with MKIDs and, conceivably, with 100,000 light channels. That’s 20 times more channels than the next-generation technology represented by the Dark Energy Spectroscopic Instrument, a future spectrograph that Fermilab is now helping to construct. Astronomers first exposed dark energy 15 years ago. Now with the help of an enormous camera, they hope to really begin to understand what it is and why the universe is flying apart at increasing speed. “PERCHED ATOP A RUGGED PEAK in the north Chilean Andes, one of the world’s largest cameras is taking portraits of deep space. Light traveling for billions of years tickles the camera’s gigantic eye every night, yielding crisp images of ancient clusters of galaxies. But the explorers who built the camera seek imprints of something dark and rather disturbing within the pretty pictures: a pervasive, invisible force pushing the universe apart. Dark energy — the name given to the obscure driver of cosmic acceleration — is just as enigmatic today. ‘When you say dark energy, what you really mean is something you don’t know about,’ says cosmologist David Burke of the Kavli Institute for Particle Astrophysics and Cosmology (KIPAC) at the SLAC National Accelerator Laboratory and Stanford University. Is dark energy an enduring force that has always been with us, and will be forevermore? Does it fit neatly into Albert Einstein’s theories of relativity, or will its presence force us to rethink all we know about gravity? What is it? “Astronomer Daniel Kelson is part of a team working to answer an intriguing question about our universe: Why are fewer and fewer stars being created over time? He’s been collecting data for years, but one piece of the puzzle eluded him. That is, until December of last year, when he spent two nights in Chile observing the sky with the new Dark Energy Camera. Kelson came away from his observing session with the information he needed to complete his research, and with a healthy dose of respect for what he calls the “super camera,” installed at the southern hemisphere station of the US National Optical Astronomy Observatory. He’s not alone in his appreciation. The 570-megapixel Dark Energy Camera—the world’s most powerful digital imaging device, built at Fermilab and installed on the Blanco 4-meter telescope at the Cerro Tololo Inter-American Observatory in Chile—was constructed for the Dark Energy Survey, a five-year effort to map a portion of the southern sky in unprecedented detail. Since the camera was turned on in November, the DES has spent 50 nights completing the science verification phase of the experiment. When DES members are not operating the camera, it’s available for other astronomers like Kelson to use. Since last December, 19 other groups of scientists from institutions including Harvard, the University of Virginia and the University of California at Berkeley have signed up for nights with the Dark Energy Camera. 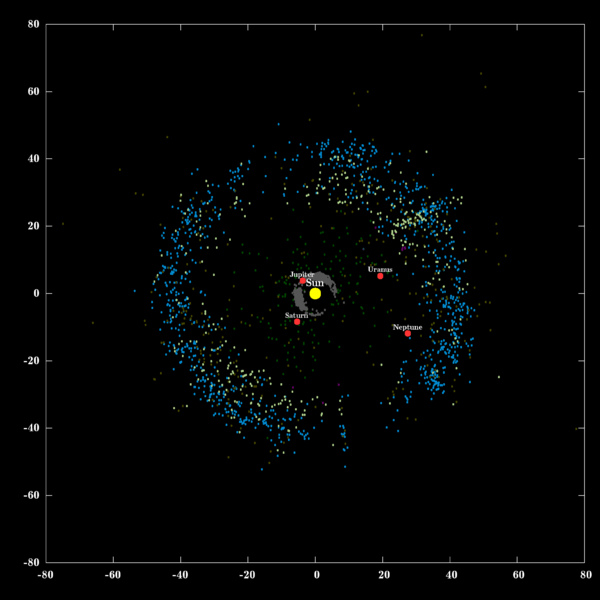 Some teams searched for asteroids while some examined the properties of galaxies. 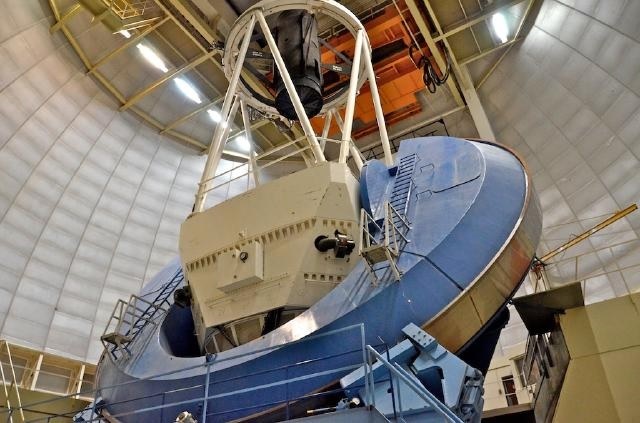 David Silva, Director of the National Optical Astronomy Observatory, has been pleased with the camera’s ability to tackle a wide range of astronomical problems of pressing interest to US astronomers.